So simple, yet, so delicious! Just a few ingredients transforms winter squash into an wonderfully scrumptious creamy golden soup! Although we call it "Creme", there is not a drop of cream or other fat/oil in this lovely soup. Butternut/Pumpkin Creme is naturally gluten, dairy, and fat free. The pepper and cayenne complement the natural sweetness of the squash and nutmeg elevates the luscious golden cream to the next level. Use your favorite winter squash; or try any of the ones pictured below. We love this cream so well that I often make a double batch so there is plenty to enjoy and share with a friend. Butternut squash is often available already peeled and cut - the hardest part of prep already done! so it is easy peasy and quick. Onions maybe omitted; if you omit them, a pinch or two of freshly ground cumin maybe added. Place butternut, onion,cashews, turmeric, nutmeg, salt to taste and cayenne if using, in a pan with a cup of water; cook until squash is tender. Check to make sure there is enough water and the veggies do not scorch or burn. Let cool a little. Puree the cooked veggies and process until smooth and silky. The veggies may need to be pureed in 2 or 3 batches. Although I prefer a regular blender for the silky texture it gives, an immersion blender maybe used as well. Add a little extra water as needed to get the right consistency and thinness. Pour the puree back into the pan and heat through. Serve hot with additional freshly ground pepper and your favorite garnishes. Seasoned Salt is a handy item to have in the pantry; it is fabulous to spice up everything from sliced veggies/salads, roasted, steamed, boiled or grilled vegetables, and your favorite recipes. Although commercial preparations are available, many have fillers, preservatives, anti-caking agents, etc. This easy home-made seasoned salt is quick and easy and the ingredients can be adjusted to personal tastes and preference. Have fun experimenting with different amounts and proportions or your favorite herbs. If you like a smoky flavor, use smoked paprika. If using celery seeds, process in a spice grinder with a little of the salt until pulverized and proceed with the recipe. Stir together all the ingredients for the appropriate seasoned salt you prefer and store in a clean, dry, airtight container. Mexican Seasoning Mix is an important spice mix for the pantry; it is not limited to seasoning only beans for burritos and tostadas but is also great for spicing up stir-cooked veggies (think fajitas! ), rice, corn, Mexican Fiesta Soup, veg chili, etc! In fact, stir in Mexican seasoning mix into any recipe where you'd want to add a bit of spice. We love to slather grilled/steamed corn on the cobs with a concoction that includes lots of the Mexican seasoning mix ..... more on that soon :-). Although commercial mixes are readily available, most have unknown "spices", sugar, or fillers such as corn meal; homemade is the way to go if one wants to eliminate all those. This is an easy and quick recipe that lasts well if kept clean and dry. If you like to eliminate onion/garlic, omit them; the seasoning mix is delicious with or without them. Mix all the ingredients thoroughly in a bowl. Pour into a clean, dry, jar with a tight fitting lid. Store the spice mix in a dry cupboard. Use as needed; for spicing Frijoles (Pinto Beans for burrito, taco, etc), you might like to add 1-2 Tbsp or more to taste for each cup of dried beans after the beans are cooked. For stir-cooked veggies or rice dishes, add about 1 tsp - 1 Tbsp depending on the level of spiciness required. Here is a delightful rib-sticking versatile dish that might evoke memories of Mac & Cheese especially if you choose golden potatoes although any type will work! Do serve the gratin over the greens not just for the added nutrition but also for the lovely taste. Another fabulous gratin to add to the repertoire just like this one. As it works well to make ahead, it is great to just bake and serve! Cauliflower, grains/potatoes, topping, etc maybe prepared ahead also and then assembed and reserved until baking and serving. If you choose potatoes, they maybe roasted along with the cauliflower. I love to add carrots and/or peas often also. 1. MAKE THE ROASTED CAULIFLOWER: Preheat the oven to 375°F. Line a baking sheet with parchment paper and lightly grease a 9-by-13-inch casserole dish with nonstick cooking spray.In a large bowl, toss the cauliflower with the season with salt and pepper. Pour into an even layer on the prepared baking sheet and roast until tender and golden brown, 20 to 25 minutes. 2. COOKED GRAINS/POTATO: Choose which you would like - grains or potato. Cook the grains as usual if that is the choice. If your choice is potato, cut the potato into short but sticks and cook them or roast with the cauliflower. 3. Make the STEEPED MILK: combine the milk, herb sprigs, black pepper, and crushed fennel seeds. Warm the milk until very hot; steep for 10 minutes on low heat. Strain, discard the herb-spice solids, and season the steeped milk with the salt. 4. MAKE THE GRATIN: Heat a large pot over medium heat, the flour to the pot and cook, stirring constantly, for 2 to 3 minutes until toasted. Pour out onto a plate. 5. Add the onion with a little water to the same hot pot and sauté until translucent, 4 to 5 minutes. Add the garlic and cook until fragrant, about 1 minute more. Mix in the toasted flour. Add the steeped milk gradually, whisking to incorporate. Bring the sauce to a simmer and cook until it thickens, 2 to 3 minutes. Remove the pot from the heat. 6. Stir in the minced herbs, nutritional yeast, the cauliflower, and the cooked grains/potatoes, season generously with pepper, salt to taste, and mix thoroughly. 8. MAKE THE TOPPING: In a medium bowl, combine the topping ingredients. Sprinkle it in an even layer over the cauliflower mixture when ready to bake. 9. BAKE: at 375°F until the gratin is bubbly and has thickened slightly, about 30 minutes (add 10-20 minutes more to baking time if refrigerated). 10. SERVE: Place about 1 - 1 1/2 cups of the greens on each plate and place the hot gratin on top. Serve hot immediately. Zucchini Pachadi/Raita is absolutely delicious and is never watery like those one might encounter usually or at most restaurants. Zucchinis are our vegetables of choice for making raita/pachadi ever since Amma used them brilliantly instead of the ubiquitous cucumbers! This is how Amma made it but for the dairy yogurt and oil in the talippu; I only made it non-dairy and with no added oils - so it is a slight make-over of the original classic Pachadi/Raita. Zucchinis are sturdier veggies and not as juicy as cucumbers even though they are both part of the cucurbit family. We do love cucumbers too - just not in our raita! Another great recipe where the tender zucchinis can shine and a fabulous way to use up the abundant crop from the exuberant plants in your garden - those who grow them can attest to the generosity of these plants :D.
This raita also makes a wonderful starter/appetizer by itself or paired with warm Roti (Indian whole wheat tortillas), fried or roasted papadams, and/or your favorite chips. Any non-dairy yogurt will work; use a plain unsweetened and unflavored non-dairy yogurt such as cashew, almond, or coconut milk yogurt. We love cashew/tofu yogurt too; the recipe is given below. Finely mince the coconut with the chiles (or grind without adding any water (can use a little of the yogurt) in a blender and proceed with the rest of the directions. Lime/lemon juice may not be depending on the yogurt. Place the drained cashews/tofu in a blender along with as much of the milk/water as needed to blend easily(use a little at a time), coconut, green chillies, lime/lemon, and salt to taste. Blend until smooth like yogurt. Remove the cashew/tofu yogurt to a large bowl. Place the coconut and green chiles in a blender along with a little yogurt as needed to blend easily (use a little at a time). Blend until smooth like yogurt. Scrape into a large bowl. Add the rest of the yogurt. Wash and grate the zucchinis; squeeze them and discard the juices or save it for additing to another dish or broth. The zucchinis need not be squeezed dry; just remove some of the excess moisture. Add zucchini to the bowl with the yogurt. Wash, deseed, and chop the tomatoes. Add to the bowl along with the onions and cilantro. Add a little salt to taste but not too much; raita should be sweet and not too salty. Make the tadka/thalippu: heat a small pan and add the mustard and dal. When mustard seeds subside popping and dancing, add asafoetida, curry leaves, ginger and green chile with a spoonful of water; cover and cook for a couple of minutes to soften the ginger and chile, let cool a little and pour over the raita and mix well. Chill until ready to serve. Serve as a salad, starter, or with any rice dish, Roti or Naan, curries/dal, Dosa, Adai and/or Upma. Enjoy!! Jaggery-sweetened treats are enjoyed all over India but Masala Gud or Gur is particularly enjoyed during the cold winter months in the North. It is considered warming and helpful for digestion with not only the warming jaggery but also all the spices. Instead of the after-meal mint, offer these for a little treat with some health benefits. Masala Gud is very rich with the medicinal seeds and spices; chew well to enjoy and get the benefits of all the seeds! Masala Gud is quite delicious. Hema told me that she made it one evening and left it to cool and set for the next day. She woke up around midnight by some strange noises to find her husband munching away! He couldn't resist the aroma of the cooling masala gud and didn't want to wait :D.
Heat ghee in a thick bottom vessel n add gud. Keep stirring till it becomes liquid. You can dryroast the fennel, ajwain, and cumin lightly over low heat for a few seconds, crush them coarsely or keep them raw and whole. Add the seeds along with the ground spices to the melted jaggery. Mix well, add the nuts and keep heating and stirring for 2 minutes. Pour the masala gud into a greased plate. Cut while warm, let cool completely, and keep in an airtight container when cool. I added all the nuts plus extra sesame to 500 g of gud and 1 T coconut oil. Included some pepitas (pumpkin seeds) and sunflower seeds in the nut mix - delicious. I think more ginger and cardamom would be nice plus even more nuts as it comes out very sweet! Follow the procedure in the original Masala Gud. I am calling this Masala Date Bites! 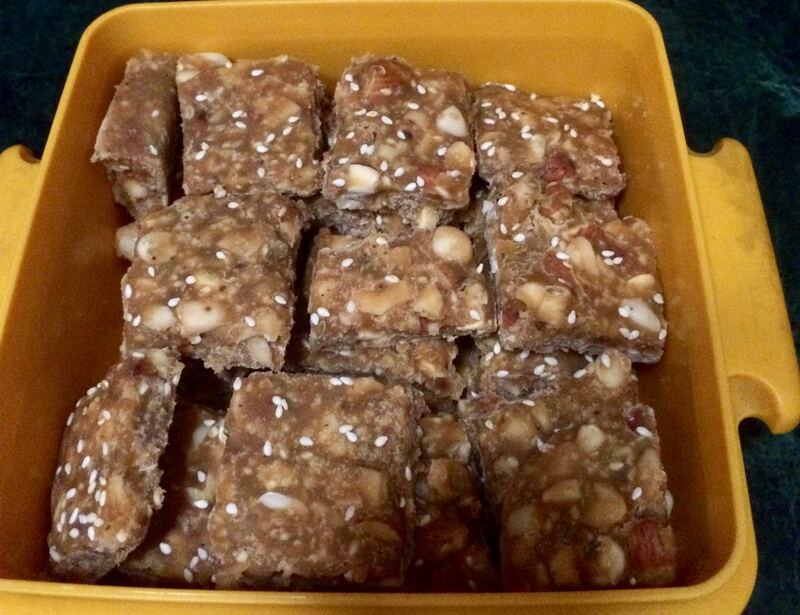 This no-cook one uses dates instead of the Jaggery. 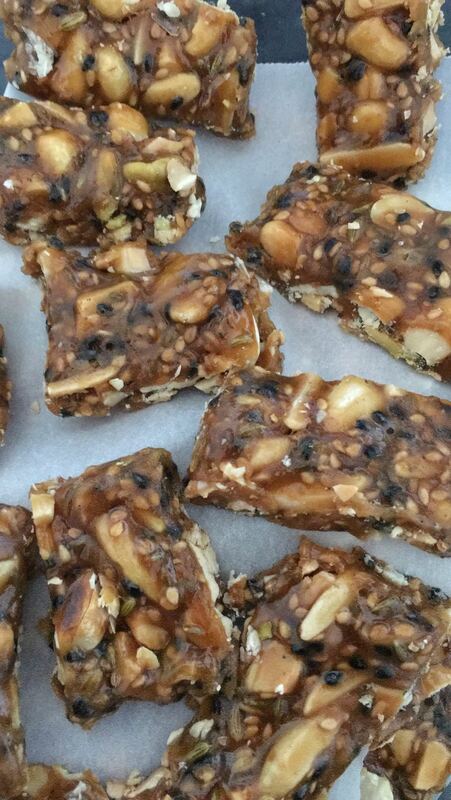 I used cashews, almonds, pistachios, sunflower seeds, and pepitas (pumpkin seeds); other nuts or seeds maybe added also. Dry toast all the nuts and whole seeds lightly; the cumin, fennel and ajwain maybe left raw or roasted. If the dates are dry, soak with a couple of tablespoons of warm water. If the dates are moist and soft, no need for soaking. Process the dates in a food processor until finely chopped. Add the almond butter if using and flax seeds along with the spices and process until combined. The mixture maybe sticky, which is perfect as we want all the nuts and seeds to stick together! Add the nuts and seeds to the food processor bowl and pulse until combined. Or, scoop the date mixture into a bowl, add the nuts and seeds and knead/mix well. When kneading and forming into balls, moistening your hands with a little water occasionally keeps the date mixture from sticking to hands. Roll into balls using hands or press into a pan lined with parchment, chill until firm, and cut into little squares, about 24. Store in the refrigerator. 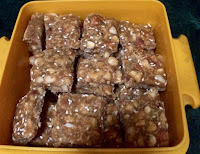 Serve 1 or 2 masala date bites per person after meals. Take little bites and take time to chew well. I remember eating Fresh Fruit Salad with Vanilla Custard for the first time; tiny cubes of succulent tropical fruit nestled in a cool bed of smooth custard - Perfection! Although I don't recall all of the fabulous fruits except perhaps the mango, pineapple and grapes, my 13-year-old self was completely mesmerized by the lovely delight! Fresh Fruit Salad is fabulous when there is an abundance of ripe fruit. Choose a variety of fruits for their flavors, color and texture. Cut all large fruits into small dice; most small berries maybe left whole. It is a truly luxurious experience to enjoy a well prepared treat. Just like the chopped veggie salads - Cucumber-Tomato and Kale Bhel - everyone at our house adores a chopped fruit salad also - a labor or love, well worth the effort! Besides mango, pineapple, banana, and strawberries, also include watermelon, canteloupe, honeydew, papaya, pomegranate, kiwi, grapes, pineapple, orange segments, peaches, apricots, cherries, blueberries, blackberries, and/or other beauties in season. Most fruits will work well - have fun with the many delicious choices. Serve it as a breakfast, snack, or dessert. I love a big bowl for breakfast with plain unsweetened non-dairy yogurt instead of the custard and/or gluten-free granola on top. Leave out the custard and it can even be a starter! Most extra fruits maybe frozen and/or any leftovers maybe made into a smoothie! I have not given amounts for the ingredients since the fruits vary according to seasonal availability, selection, and the number of servings one may wish to make. Allow about a cup of fruit (or more) per person; start with a few favorite fruits adding more as you go along to get the quantity as well as color, flavor, and texture you want. Custard maybe made with other flavorings besides vanilla; we love almond too. Fruit Salad pictured here is made with only 5 fruits as it was just for 2 servings; it can be quite simple or elaborate with many kinds. Prepare the vanilla custard; it maybe served warm or cold. Use unflavored non-dairy milk and add your own flavorings like vanilla and/or almond for best results. If serving it cold, allow enough time for cooling the custard. Spoon a little of the cold custard into the dishes and then place fruit on top. Warm custard maybe spooned over when ready to serve. Dice the fruit into uniformly small cubes. Although it is fine to make a big bowl of fruit salad, I find that placing the fruit directly into individual bowl avoids crushing them. Divy up equal amounts of the fruit into the bowls as you go. Serve garnished with the almonds and mint sprigs. Enjoy!! Cauliflower Tabbouleh is a refreshing salad for the warm sunny days of summer with the abundance of fresh veggies. This colorful and healthy salad is a makeover of the traditional Tabbouleh from the Mediterranean region. Using riced cauliflower (cauliflower florets that have been finely chopped) instead of the usual grains makes it gluten free! Although the regular white cauliflower is fine, have fun using the the show-stopping rainbow-hued cauliflowers as well as other veggies available at your local farmers markets or favorite grocers. I love to use the multi-colored sweet mini peppers and radishes in this salad. A good knife or the food processor makes short work of chopping all the veggies; pulse them if using a food processor so you don't end up with mush! If Sweet Mini Peppers are not handy, use red, orange and yellow bell peppers (capsicums). A little sprinkle of Chaat Masala adds a lovely piquant pop; it is readily available in Indian Markets. Although I don't use any oils, a little (~ 1 Tbsp or so) Extra Virgin Oil maybe used. Use your favorite veggies make this uniquely your own! Riced cauliflower is available in most markets. If not, it is quite easy to rice: chop portions of the veggie using a good knife or separate the florets and pulse in a food processor bowl fitted with the metal S blade. In a large bowl, combine all the prepared vegetables and herbs. Add a little salt and lime/lemon juice to taste; mix well. Season with more lime/lemon juice, salt, and pepper as needed. Chill if not serving right away. Although best eaten freshly made, Cauliflower Tabbouleh will stay fresh for 2-3 days. I love this Spinach Salad bursting with the irresistible colors and flavors of fresh veggies and luscious berries! The simple balsamic dressing makes it absolutely delicious. One of our go to recipes on week nights :D as it is very easy and quick to prepare. The Balsamic Vinaigrette is light yet flavorful. This recipe makes more dressing than needed for a serving; I save the extra in a squeeze bottle ready for the next time. Other nuts/seeds and/or berries maybe added to the salad instead of the pecans, strawberries and blueberries. Prepare dressing and toast the pecans; both maybe done ahead and reserved. Combine the water and cornstarch in a small pan, mix well to form a slurry, and heat until boiling; cook for a couple of minutes until the starch is cooked and the mixture is almost translucent. Let cool completely. The cornstarch mixture makes a fabulous oil substitute! In a small blender, combine all the ingredients for the Balsamic Vinaigrette, process until smooth. Taste and correct the seasonings, pour into a clean jar, and set aside. Chill the vinaigrette if made ahead. The dressing will stay fresh for a week. Toast the pecans without any oil in a dry skillet or at 375 degrees for 5-6 minutes, until lightly brown. Watch carefully as the nuts burn very quickly! Remove from oven and let cool. Pecans maybe toasted ahead of time and reserved in a zip-top bag or other container in the fridge until needed. Make the salad just before serving. The veggies maybe prepped ahead and reserved in the fridge. Place the spinach on a plate/bowl and top with the rest of the veggies. Top the salad with the berries and pecans. Serve immediately drizzled with the Balsamic Vinaigrette! Bon appettit!